License Plate Recognition (LPR) systems, also known as Automatic Number Plate Recognition (ANPR) systems, read the vehicle plate numbers. LPR/ANPR driven systems can replace tickets and enable a “Ticketless” and even “Gateless” pay by plate solution for a parking facility. LPR/ANPR can also provide unmanned 24/7 coverage of a parking facility increasing revenues and decreasing leakage by enforcement and monitoring of tariffs and activities. 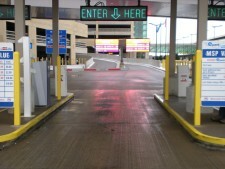 The LPR system can match entry and exit license plate reads for quicker entry and exiting of the garage along with easier verification due to a real-time link to the PARC system. The system can also handle lost or switched tickets, and by cross-referencing with other data, can accurately bill the customer in question, in addition to other forms of “leakage”. The LPR systems can also provide alerts both for VIP customers as well as vehicles of interest who may have a history of billing infractions or other problematic behavior such as tailgating. A video presentation of one of the automated parking installations is a high rise office building in Fountain Place in Dallas, Texas. The parking structure has 90% monthly authorized vehicles. The goal was (1) faster entrance and egress and (2) equipment to limit lost revenue from lost tickets or electronic transactions in order to limit cost and enhance revenue.